Now, after four years, I’ve finally figured the show out. The Office is not a random series of cynical gags aimed at momentarily alleviating the existential despair of low-level grunts. It is a fully-realized theory of management that falsifies 83.8% of the business section of the bookstore. The theory begins with Hugh MacLeod’s well-known cartoon, Company Hierarchy ..., and its cornerstone is something I will call The Gervais Principle, which supersedes both the Peter Principle and its successor, The Dilbert Principle. 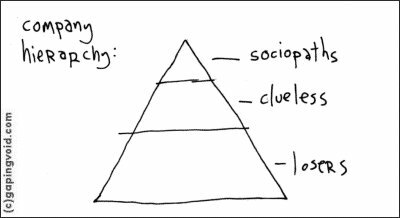 The McLeod hierarchy, and the theory which is the cornerstone of Ricky Gervais' comedy (and its US remake), divides organisations into three psychological types, somewhat facetiously labelled Sociopaths (i.e., those driven by the desire to control and dominate, without whom no decisions would be made), Losers (i.e., those who have made the tradeoff of security for control of their destiny; these need not necessarily be losers in the colloquial sense) and the Clueless (who are in the middle of the hierarchy, but are one level below losers in self-awareness; whereas the loser typically puts in the minimum they can get away with, the clueless give their loyalty to the organisation out of a misplaced faith that it will be reciprocated). Initially, organisations start off with a few Sociopaths in the driving seat and a corps of Losers doing the gruntwork in exchange for a regular paycheque; as they get larger, a layer of Clueless is added, and expands. This layer may be imagined as a dense, inert substance, which serves to keep the otherwise inherently unstable organisation from imploding. A sociopath-entrepreneur with an idea recruits just enough losers to kick off the cycle. As it grows it requires a clueless layer to turn it into a controlled reaction rather than a runaway explosion. Eventually, as value hits diminishing returns, both the sociopaths and losers make their exits, and the clueless start to dominate. Finally, the hollow brittle shell collapses on itself and anything of value is recycled by the sociopaths according to meta-firm logic. The Gervais Principle builds on this, and describes how Losers who put in more than is in their best interest get promoted to middle-management, not because of their talents, or because of their incompetence (as per the Peter Principle or Dilbert Principle), but because they are most useful as pebbles in the insulating layer of the Clueless. A loser who can be suckered into bad bargains is set to become one of the clueless. That’s why they are promoted: they are worth even more as clueless pawns in the middle than as direct producers at the bottom, where the average, rationally-disengaged loser will do. At the bottom, the overperformers can merely add a predictable amount of value. In the middle they can be used by the sociopaths to escape the consequences of high-risk machinations like re-orgs. Which brings us to the other major management book that is consistent with the Gervais Principle. Images of Organization, Gareth Morgan’s magisterial study of the metaphors through which we understand organizations. Of the eight systemic metaphors in the book, the one that is most relevant here is the metaphor of an organization as a psychic prison. The image is derived from Plato’s allegory of the cave, which I won’t get into here. Suffice it to say that it divides people into those who get how the world really works (the sociopaths and the self-aware slacker losers) and those who don’t (the over-performer losers and the clueless in the middle).